Wedebrand (Wederbrand) was a soldiers name. in such a way that each "rote" (a minior part of a parish) hade to keep a soldier. Livgrenadjärer (soldiers on horse). They belonged to Överste Löjtnantens Company. The farmers had to support him with food, land and a house. from another. They got name as Granat, Rask, Palm etc.or names associated to the name of the place where they lived. Like Wedhem. Wedebrand was such a name. The children of soldiers sometimes used the soldiername sometimes not. When the soldier resign from his duty he sometimes kept the name sometimes not. He had to move out from the house to give place to the next soldier. They were likely not all related. Maybe some. At the time we have no more information about the anchestors of Pär Larsson Wedebrand maybe Lars Persson Wedebrand is a son of him. As far as we know Lars Wedebrand had no living children when he died. 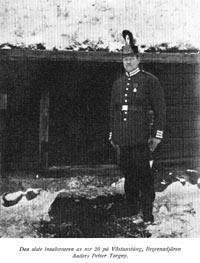 Lars Persson Wedebrand had at least two children Anna and Per Rånman (soldiers name). Sven Jönsson Wedebrand had three) children Daniel, Jöns and Abraham. Some of the living Wedebrand could be related to one of those. More research are required. The children of Sven Larsson Wedebrand have kept the surename. Allthought the spelling of the name sometimes have been changed among the 8-10 following generations (Wedebrand, Wederbrand, Wedebrant, Vedebrand, Vederbrand) The descendants of most of the children to Sven Larsson Wedebrand are documented. Searching the descendants in USA we find Wedebrand people attending both WWI and WWII.